Patrick Comerford: ‘No Man is an Island,’ says John Donne ... but what about 63 islands, one for each year? but what about 63 islands, one for each year? Of course, there are some islands that make me think that no couple are an island. The Isle of Ewe, a small island (309 ha) on the west coast of Scotland, is privately owned by JIH Macdonald-Buchanan, and the seven members of the Grant family are the one and only family on the island. They have lived at the Main House in the south of the island since the mid-19th century. Because the name of the island sounds like “I love you,” it is a romantic venue for couples who take boat trips around the island. It has also given rise to jokes about the fact that there are no sheep on the Isle of Ewe. Moriarty: My name is Count Moriarty. Have you ever heard of Lurgi? Seagoon: There’s no one of that name here. Seagoon: I love you, too. Shall we dance? Moriarty: I don’t wish to know that. On the Isle of Ewe the dreaded Lurgi struck. In six weeks, in cinq weeks mark you, Lurgi had destroyed [audience laugh] Silence please! Lurgi had destroyed the entire population! Seagoon: What a splendid story. Over the last 63 years, I have, of course, realised that I have never been nor could be an island. But to mark those 63 years today, I thought it would be interesting to celebrate 63 islands I have visited … or have tried to visit. During a recent return visit to Wexford, I acquired a new book on the islands. But it only provides information on the islands on the west coast and on Rathlin Island, and misses the many islands off the south and east coasts. Bull Island – more properly North Bull Island – in Dublin Bay is 5 km long and 800 m wide, lying roughly parallel to the shore off Clontarf, Dollymount, Raheny and Kilbarrack, and facing Sutton and Howth Head. The island, with the sandy beach of Dollymount Strand running its entire length, is a relatively new island, formed as an unintended consequence of human intervention in the bay in the late 18th and early 19th centuries. It was once said that everyone in north Dublin learned to drive on Dollymount Strand, but today Bull Island is better known as a location for kite flying. I first visited this small uninhabited island north of Howth Harbour last summer . Today, the only signs of former human life on the island are the ruins of a Martello tower and an 8th-century church, the Church of the Three Sons of Nessan. Local lore says the church was once the parish church for Howth. The island was also the scene of a famous murder case in the 1850s. Today, there are no facilities, bars or cafés on the island, but it has beautiful beaches, and despite it s proximity to Howth it feels remote and isolated. 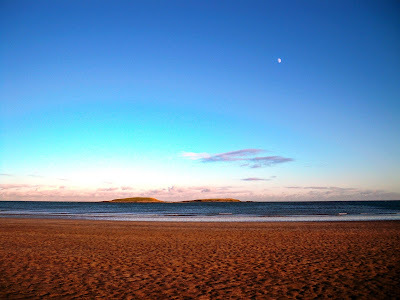 Despite its name, Red Island is no longer an island but a rocky headland connected to the mainland by a roadway or isthmus that forms part of the quay wall of the harbour in Skerries. The most noticeable landmark is the Martello Tower on Red Island. The Skerries Seapole Memorial at Red Island was unveiled recently by President Michael D Higgins. This memorial is fashioned from the old ‘Pole’ used by lifeboat crews and the Coast Guard as a viewing platform to watch for sailors in difficulty. It has been incorporated into a newly designed plinth with over 270 individual plates with the names of ships and people who have drowned at sea in the area. 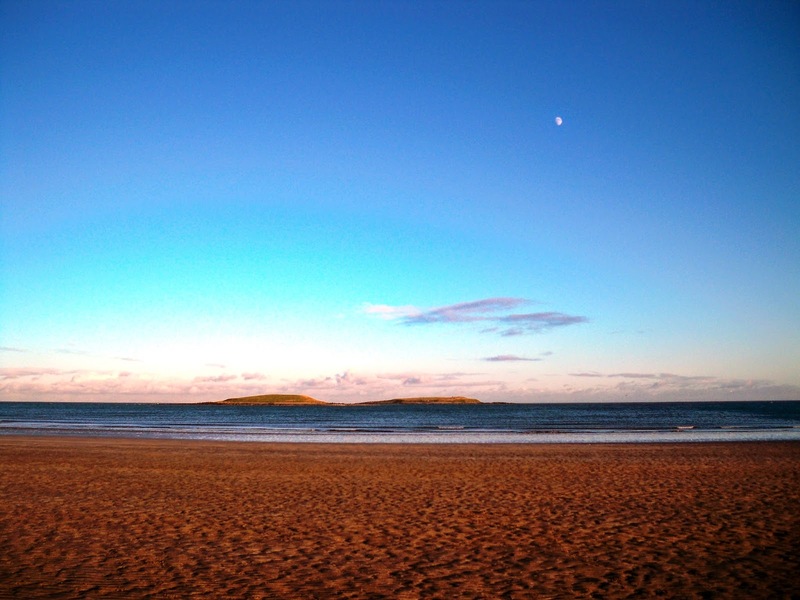 The Skerries Islands form a group of three small uninhabited islands between 0.5 km and 1.5 km off the coast at Skerries. The islands are protected of their ornithological importance for breeding seabirds and wintering waterfowl. 4, Colt Island, a small island off Red Island, is the closest and smallest of these three low-lying, uninhabited islands. It is important for breeding seabirds and wintering water fowl. 5, Saint Patrick’s Island is said to have been the site of a monastery founded by Saint Patrick. It flourished until the Viking raids. In 1220, the Archbishop of Dublin moved the monastery to the mainland because the island was in too inaccessible a location. This is the most distant of the three low-lying uninhabited islets off the headland of Skerries. The island has low cliffs and lies about 1.5 km from the mainland, and the vegetation consists of grasses, brambles and hogweed. It is the most important of the three islands for breeding seabirds, including Cormorant, Shag and Herring Gull. 6, Shenick Island is the most southerly of the Skerries Islands. 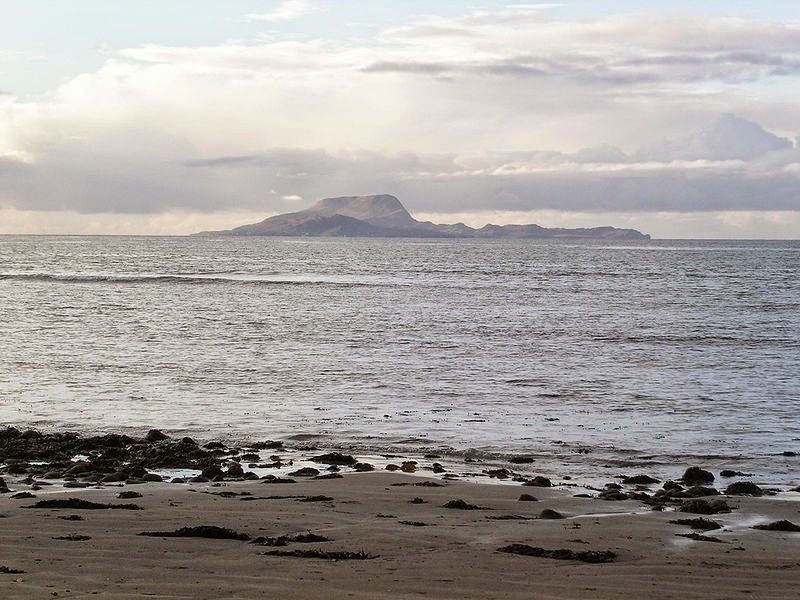 It has a Martello tower that provides a visible link between the Martello towers on Red Island and Drumanagh. Since 1987 the island has become a wildlife reserve. It is populated only by seals and a few different species of seabirds. 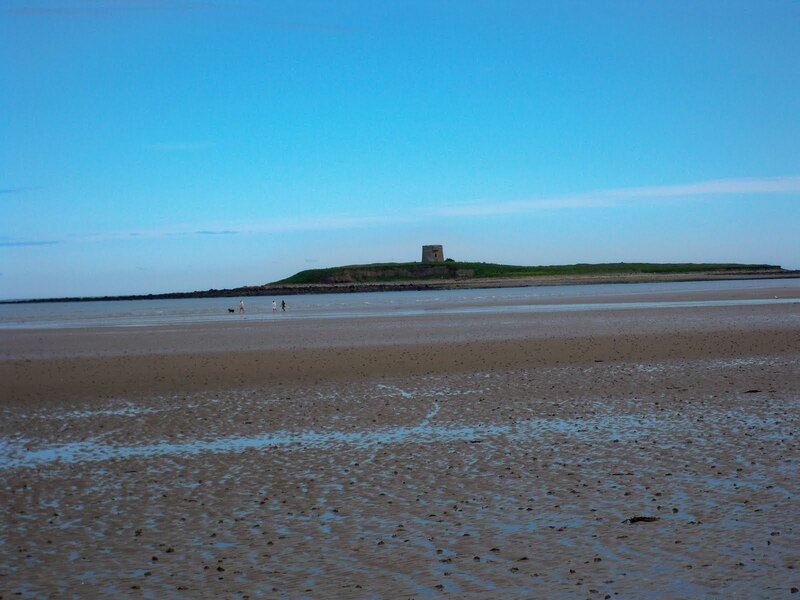 It can be reached by boat but at low tide it is possible to walk across a sand bank from Skerries to the island. I have often looked out at Lambay Island from what was my grandmother’s childhood home in Portrane, and I once tried but failed to reach it on a small boat from Skerries. Lambay is 4 km offshore from Portrane. 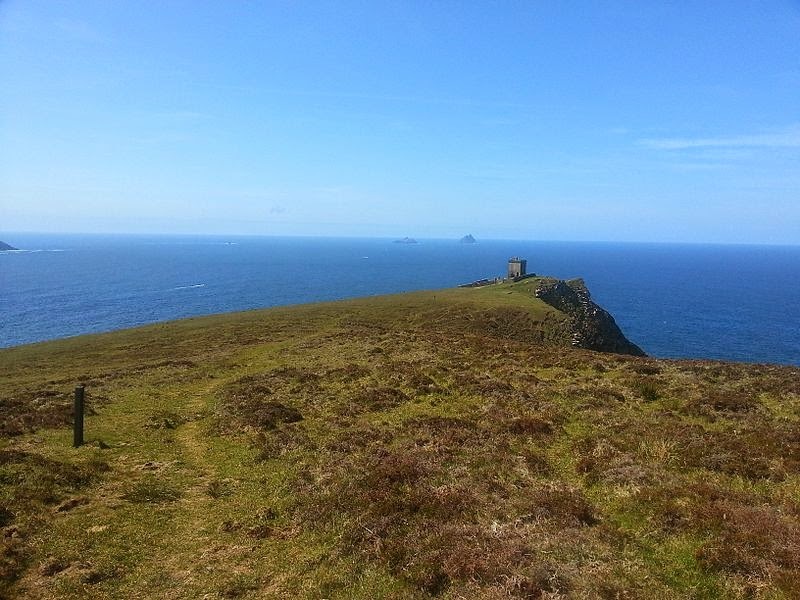 It is the easternmost point of the state and is the largest island off the east coast of Ireland, about 2.5 sq km in size. The Greek writers Pliny and Ptolemy knew about the island and referred to it as Limnus or Limni. Sitric, the Viking King of Dublin, granted Lambay to Christ Church Cathedral, and in 1181 Prince John granted it to the Archbishops of Dublin. This was reconfirmed by King Edward in 1337 and by King Richard in 1394. A later archbishop gave the rents of the island to the nuns of Grace Dieu, along with the tithes of the Lambay rabbits to and the rabbit taxes, worth 100 shillings a year. 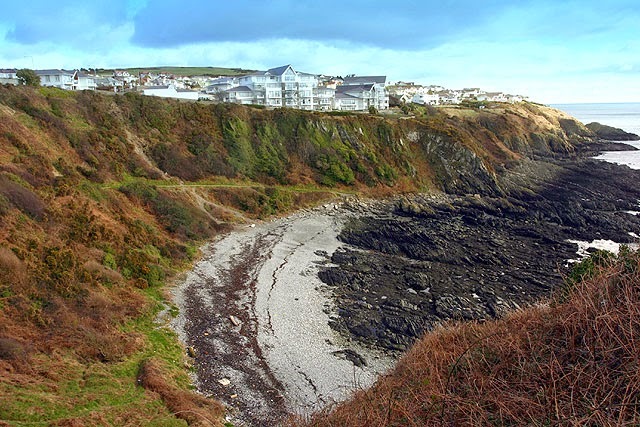 Count James Consedine sold Portrane House and bought Lambay in 1888, developing the island for hunting. The Baring family of banking fame bought Lambay Island in 1904 for £9,000, and Cecil Baring, 3rd Lord Revelstoke, commissioned Sir Edwin Lutyens to renovate and restore the island castle. The island is still privately owned by the Baring family trust, and the castle is the only Lutyens-designed home still lived in by the family that commissioned it. Islandbridge between the Phoenix Park and Kilmainham takes its name an island formed by the creation of a mill race towards the right bank of the River Liffey, while the main current of the river flows to the left. The War Memorial Gardens are dedicated to the memory of 49,400 Irish soldiers who died World War I, with their names inscribed in the beautifully illustrated Harry Clarke manuscripts in the granite bookrooms. These gardens are also of architectural interest and beauty, and are one of four gardens Ireland designed by Sir Edwin Lutyens – the others are Lambay Island, Howth Castle and Heywood Gardens. Dalkey Island (9 ha) is just 300 metres offshore from the village of Dalkey, although I arrived there for the first time last year  on a 3 km boat trip from Dún Laoghaire Harbour. The island is uninhabited, but you can still see the ruins of houses, a church and a Martello Tower. The tiny islets to the east of Dalkey Island are known as "The Muglins" and are a different group or chain. Because they are a danger to shipping they have been fitted with a distinctive beacon. Enniskillen is the cathedral town of the Diocese of Clogher and the county town of Fermanagh. 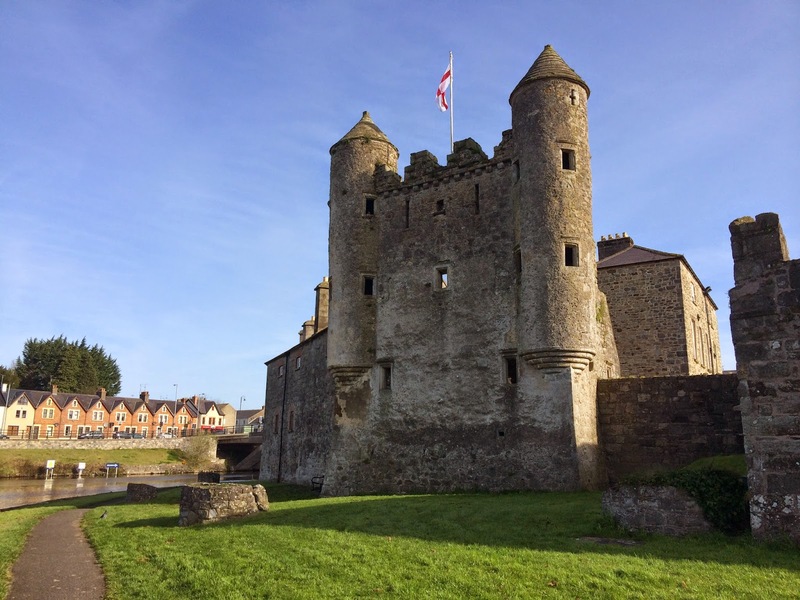 It takes its name from Irish Inis Ceithleann, meaning “Ceithlenn’s island,” and the heart of the town is in an island in the centre of the county between the Upper and Lower sections of Lough Erne. Achill Island has been one of my favourite boltholes for many years. I often retreated there, promising myself I was going to use the time to write and to be creative. In winter, without a dial telephone on the island, I was inaccessible. In summer, as the island basked in sunshine and I looked at the whitewashed cottages, the golden beaches, the blue skies and the blue seas, I could imagine I was on an Aegean island in Greece. I have been a regular visitor to Achill since I first visited it 1974, and in recent years I have been privileged to be invited to speak at the Heinrich Böll Summer School on Achill Island in 2013 and 2014. We can say that Inishbiggle, off the east coast of Achill Island, is an island off an island, but we could also call it a new island, for it has been inhabited continuously for less than two centuries. As an island, Inishbiggle is unique in Ireland. While other islands, such as Valentia in Co Kerry, may have both Catholic and Church of Ireland churches, Inishbiggle is the only island with only a Church of Ireland church. In addition, Holy Trinity Church, on the eastern side of this island, is the oldest and probably the only truly historical building on the island, and perhaps also its most beautiful building. I visited Clare Island once while I was staying on Achill Island. Clare Island, catching a ferry from Roonagh Pier, near Louisburgh. This is a mountainous island at the entrance to Clew Bay in Co Mayo. It was once the home of the “pirate queen,” Grace O’Malley, but today has a population of only 145 people. I was there to visit the small 12th century Cistercian Abbey during a major conservation project in the 1990s. This is where Grace O’Malley is buried, but the abbey church is worth visiting for rare mediaeval roof paintings, depicting mythical, human and animal figures including dragons, a cockerel, stags, men on foot and on horseback, a harper, birds and trees. The village of Cong, on the borders of Co Galway and Co Mayo and the edges of Connemara, stands on an island formed between Lough Corrib and Lough Mask by a number of streams that surround it on all sides. Cong was the home of Sir William Wilde, father of Oscar Wilde, but is also known for Ashford Castle, built by the Guinness family and now a luxury hotel, and as the location for the 1950s film The Quiet Man. In that movie, the village is named Inisfree, and today a boat known as ‘The Isle of Inisfree’ offers cruises on Lough Corrib. The grounds of Cong Abbey contain an island off this island. The monks’ fishing house, probably dating from the 15th or 16th century, is on an island in the River Cong leading to Lough Corrib. The house is built on a platform of stones over a small arch that allows the river to flow underneath. A trapdoor in the floor opens to a place where fresh fish were once kept. I have yet to visit the Aran Islands in Galway Bay. But I have visited Nun’s Island in the centre of Galway. This island is formed by the River Corrib and a number of streams leading from the river into Galway Bay. In the 19th century, Nun’s Island was at the heart of industrial Galway. 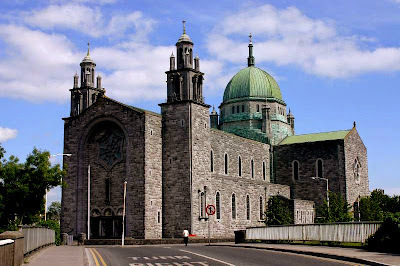 Galway’s Roman Catholic Cathedral, built in the 1960s, stands on the island, and was dedicated on 15 August 1965. Ennis is the county town of Co Clare and was first built on an island in the River Fergus just north of where it enters the Shannon Estuary. The Irish name for the town is short for Inis Cluain Ramh Fhada, or Island of the Long Rowing Meadow. The island was formed between two courses of the River Fergus on which the Franciscan Abbey was built. As a travelled through Co Clare, from Bunratty to Limerick, late last summer, I was taken by the number of islands in the estuary of the River Shannon. Of course, I had already visiting King’s Island in Limerick and preached once in Saint Mary’s Cathedral when Maurice Sirr was the Dean of Limerick. 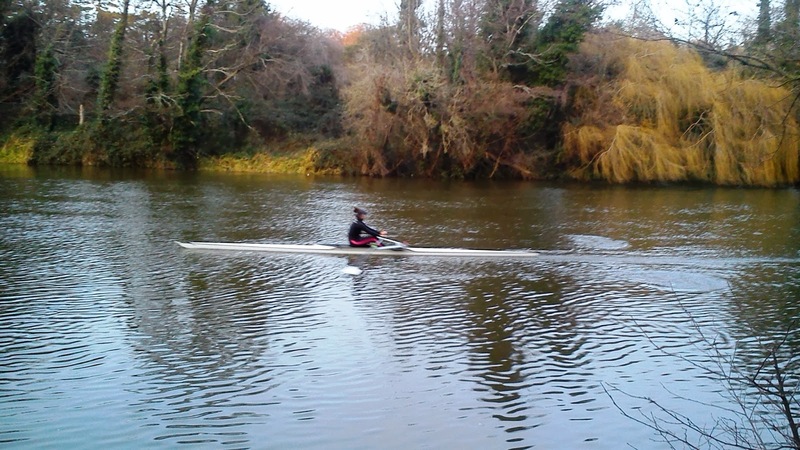 King’s Island in the centre of Limerick is often known simply as The Island and consists of two distinct areas, Englishtown and Saint Mary’s Park. 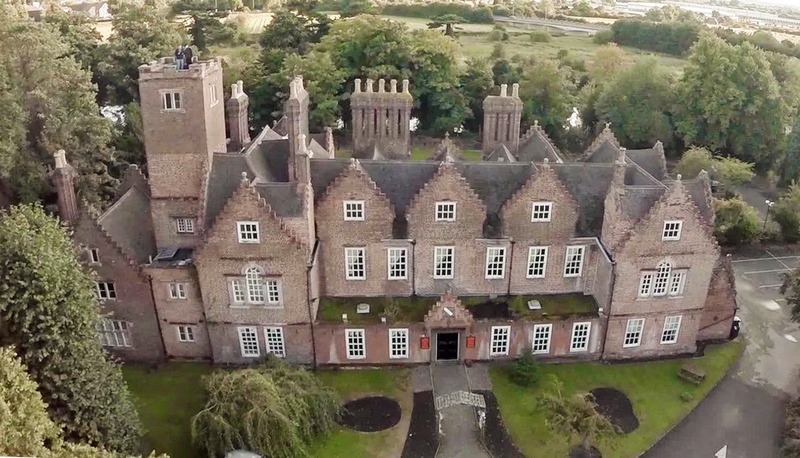 Englishtown, the historical city of Limerick, is on the southern end and Saint Mary’s Park is on the northern end of the island. The island is formed from a distributary of the River Shannon. The Abbey River diverts from the Shannon before meeting it again at a confluence near the Potato Market. The island probably takes its name from King John’s Castle, built in the 13th century. However, a map by Ptolemy and dating from 150 AD shows a place called Regia at the same site. King’s Island in Limerick is the best known island in the River Shannon, and includes Saint Mary’s Cathedral as well as King John’s Castle. But there are many tiny islands in the River Shannon between Bunratty and the mouth of the river. I spent part of the summer of 1966 as a teenager in Ballinskelligs in the Kerry Gaeltacht. But the most memorable part of that summer has more to do with watching the World Cup Final than learning anything in the Irish language. We never got to visit the Skellig Islands, but we were brought on a day trip to Valentia Island, one of Ireland’s most westerly points. It is about 11 km long and almost 3 km wide. Although I have lived in Wexford and return there regularly, I have never been to either Our Lady’s Island in south of the county, or to the Saltee Islands of the south coast of Wexford, although I have often looked longingly at the Saltees from the coast at Kilmore. The Saltee Islands are two small islands 5 km off the coast of Co Wexford: the Great Saltee is 89 ha in size, and the Little Saltee is 37 ha. In 1798 two leaders of the United Irishmen, John Henry Colclough and Beauchamp Bagenal Harvey, took refuge in a cave on the Saltee Islands, hoping to escape to France. They were betrayed, arrested and brought to Wexford town, where they were hanged on the bridge on 28 June 1798. The Great Saltee was extensively farmed in the 19th century, but farming ceased in 1900-1939, and came to an end in 1943, when the Saltees were bought privately by the Michael Neale, who styled himself Prince Michael I and had himself crowned on the island as Prince of the Saltees. He died in 1998 the islands are now owned by his five sons Michael, John, Manfred, Paul and Richard and his daughter Anne. 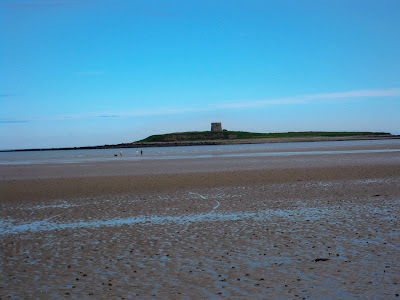 The Ballast Island is an interesting human construction in Wexford and a daily sight for every resident of the town. This unusual artificial island, opposite the Talbot Hotel, was built in 1937 as a ballast bank where ships entering or leaving Wexford Harbour could take on or off-load their ballast of sand or stones that they needed to remain stable at sea while travelling without cargo. The island of Begerin, meaning “Little Ireland,” is one of the earliest Christian sites in Co Wexford, and is now part of Wexford Slobs. Begerin is one of several small islands of glacial drift that protruded above the mud flats of Wexford Harbour. In the fifth century, the early Christian missionary, Saint Ibar, established a monastery there. Saint Ibar may have died ca 500 and was buried on the island. His monastery lasted for several centuries after his death, despite being sacked by the Vikings many times in the 9th century, and seems to have had close links with the Isle of Man, Cornwall and Scotland. The monastery may have closed in 1160. In 1171, the inhabitants of Wexford town imprisoned the Norman leader, Robert FitzStephen on Beg Erin. Ten years later, the Roche family gave it to the Benedictine monks of Saint Nicholas at Exeter. They built a church on the island in the 13th century, but in 1400 the island passed to the Augustinian canons of Selskar Abbey in Wexford town. Ibar is still widely used as a Christian name in Wexford, where the Church of Ireland parish church is named after him, Saint Iberius. 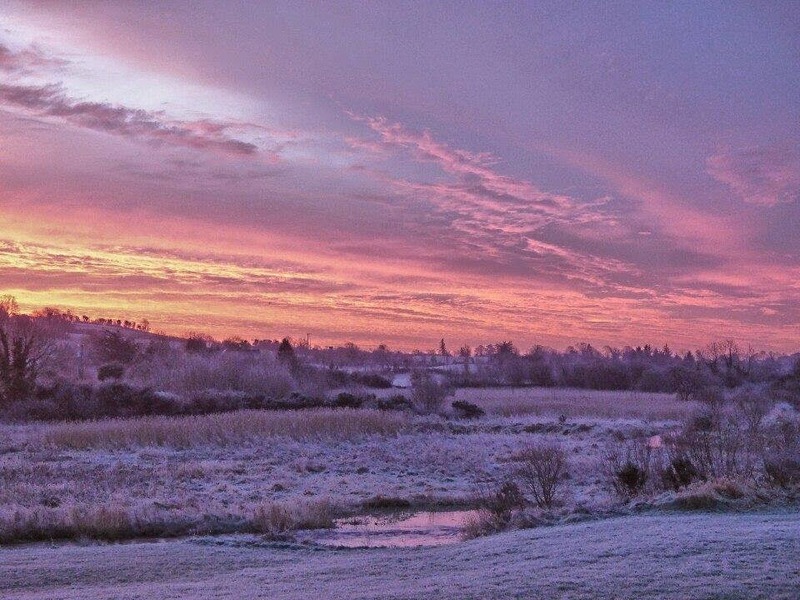 The River Slaney rises on the western slopes of Lugnaquilla Mountain in Co Wicklow, and flows south through Baltinglass, Rathvilly, Tullow and Bunclody before discharging into a narrow 12 mile long estuary just south of Enniscorthy, and finally into Wexford harbour. The name of Enniscorthy is derived from the Irish Inis Córthaidh, meaning perhaps the “Island of Corthaidh” or the “Island of Rocks.” Island Road is on the west bank of the Slaney on the north side of the town, but I have never found the original location of this island. However, the name indicates that the river once had many islands. Last autumn, on the road between Enniscorthy and Bunclody, I came across this small island in the river when I stopped to look at Scarawalsh Bridge. The bridge is a well-known landmark on the river, with six arches spanning the river and built in the late 18th century by the Oriel Brothers of Hampshire. I first stayed by Lough Ramor, in Virginia, Co Cavan, when I was a 15-year-old, and spent a holiday as a teenager in the Park Hotel. Last year, I spent a weekend with friends at the Lakeside Manor Hotel on the shores of Lough Ramor, on the outskirts of Virginia. Lough Ramor is five miles long and two miles wide, and has a surface area of 800 hectares. In 1826, Thomas Taylor, 1st Marquess of Headfort and 2nd Earl of Bective, claimed the rights and royalties of the lake, the islands and its water. The Taylour or Headfort family built a shooting lodge in Virginia which is now the Park Hotel, and I have fond memories of staying there in 1967 and learning to row on the lake. The lake has 30 to 40 islands, some of them inhabited in the past. 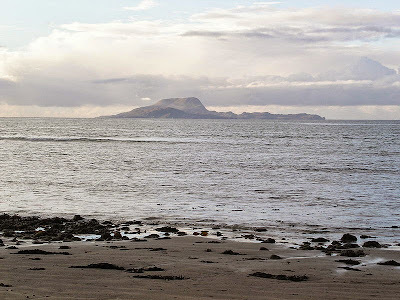 The islands have interesting names such as Great Island, Crane Island, Scabby Island, Sloo Island Woodward or Tighe’s Island, George’s Islands, Corronagh Islands, Porter’s Islands, Crossafehin Islands and Stoney Islands. Great Island in Cork Harbour is just outside Cork City, at the mouth of the River Lee. The town of Cóbh is situated on the island, which is connected by bridge to Fota Island to the north, which in turn is connected by a causeway to the mainland. In Irish, the name of the island means “Great island of the Barry,” referring to the great Anglo-Norman family who once owned most of the area. Cobh, on the south side of Great Island, was known from 1850 until the late 1920s as Queenstown. It is an important harbour and shipping port, and was the last stopping place for the Titanic in 1912. Facing the town are the two smaller islands of Spike Island and Haulbowline Island. 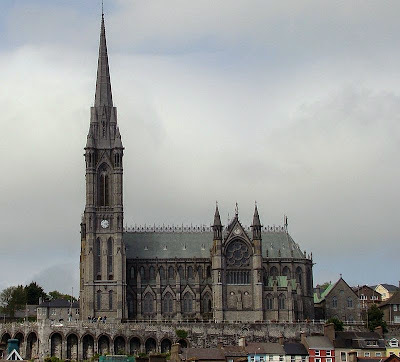 But I find the most interesting focal point at Cobh is Saint Colman’s Cathedral. Standing on a high point in the town, this Gothic Revival cathedral was designed by EW Pugin, George Ashlin and Thomas Coleman and is one of the tallest buildings in Ireland. Cork City, the second city in Ireland, is built on the River Lee which divides into two channels at the western end of the city so that the city centre stands on the island created by the channels. At the eastern end of the city centre where the channels re-converge, the quays and the docks along the river banks lead to Lough Mahon and Cork Harbour. I have visited the Isle of Man only once, back in 1965, taking the ferry from Dublin to Douglas and staying in Onchan. The Isle of Man is not part of the United Kingdom but is an internally self-governing British Crown dependency in the Irish Sea, between Ireland and Britain. The head of state is Queen Elizabeth II, but there her title is Lord of Mann. The island is one of the six so-called Celtic nations and Manx is one of the Gaelic languages. Although the island is not part of England, the Diocese of Sodor and Man is part of the Church of England. In 1266, the island became part of Scotland, and came under the feudal lordship of the English Crown in 1399, without becoming part of the English Kingdom. The Isle of Man is in the Irish Sea, almost equidistant from England, Northern Ireland, Scotland and Wales. It is 52 km long and 22 km wide, with an area of around 572 sq km. The political unit of the Isle of Man includes nearby small islands, including the Calf of Man, Chicken Rock which has a lighthouse, Saint Patrick’s Isle and Saint Michael’s Isle. Like most people who have travelled regularly between Ireland and England, I became familiar with Anglesey long before Ryan Air made travel by air cheap and accessible and I had to travel by ferry and rail. Anglesey (Ynys Mônoff in Welsh) is an island off the north-west of Wales, and two bridges span the Menai Strait, connecting it to the mainland: the Menai Suspension Bridge designed by Thomas Telford in 1826 and the Britannia Bridge. Anglesey, with an area of 714 sq km, is the largest Welsh island and the largest island in the Irish Sea. There are several small towns around the island, including Holyhead and Beaumaris and the village with the longest official place name in the United Kingdom: Llanfairpwllgwyngyllgogerychwyrndrobwllllantysiliogogogoch. Holy Island (Ynys Gybi) is an island on the western side of the larger Isle of Anglesey, and the two are separated by a narrow, winding channel, crossed by two road links and the main railway line to Chester and London. The island has an area of almost 40 sq km and a population of 13,659. The main town is the port of Holyhead, with ferries to Dún Laoghaire and Dublin, so this is the Welsh island most visited by Irish people, although few probably find it memorable. I have never been to Channel Islands, and there are many islands in England I have still not managed to visit, including the Isle of Wight, the Isle of Dogs, the Isle of Sheppey or Lindisfarne. In the Tudor era, the River Tame allowed the Comberford family to move easily between Tamworth, Comberford and Wednesbury. Broad Meadow is a 61-acre island between the two channels of the River Tame. 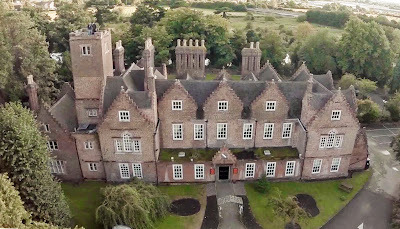 It was transferred to Tamworth Borough Council from the developers of the former Smurfit site as part of planning agreement for the development of homes. This island is recognised as a Site of Biological Importance and is a prime example of lowland meadow – a floodplain grassland habitat that is becoming increasingly rare in Staffordshire and across Britain. For example, Broad Meadow is also one of only two sites in Staffordshire where the rare Snake’s Head Fritillary can be found growing wild. It was approved for designation as a local nature reserve by Natural England last October . It is now in the process of officially becoming Tamworth’s sixth Local Nature Reserve. Broad Meadow will be run and managed under the Wild About Tamworth project – a partnership between Tamworth Borough Council and Staffordshire Wildlife Trust. The Isle of Ely is an area around the cathedral city of Ely. It is now in Cambridgeshire but was once a county in its own right. Its name is said to mean “island of eels” and it was first noted by the mediaeval historian, the Venerable Bede. But is the Isle of Ely an island? Until the 17th century, the area was an island surrounded by a large area of fenland, but the Fens were drained in 1626-1637 with a network of canals. From 1107 until 1837 the Isle of Ely was under the jurisdiction of the Bishop of Ely, who appointed a Chief Justice of Ely and exercised temporal powers within the Liberty of Ely. Henry I established Ely created the Isle of Ely as a county palatine under the bishop. An Act of Parliament in 1535/1536 ended the palatine status of the Isle, but the bishop kept exclusive jurisdiction in civil and criminal matters and was custos rotulorum. When the Liberty of Ely Act 1837 ended the bishop’s secular powers, the Isle of Ely became part of Cambridgeshire. It became a separate county again in 1889, and survived as such until 1965, when most of the area was merged to form Cambridgeshire and Isle of Ely, although the Thorney Rural District became part of Huntingdon and Peterborough. In his delightful book on the hidden secrets of Cambridge, Nicholas Chrimes, Chief interpolator of Fitzwilliam Museum, describes Cambridge as the “Treasure Island in the Fens” (Nicholas Chrimes Cambridge: Treasure Island in the Fens, 2009, 2nd ed Cambridge, 2012). But if Cambridge is an island in the Fens, then, as the map on the cover of his book shows, there is a number of islands in Cambridge, at least one of them a true treasure island, created by the channels branching off from the River Cam. Robinson Crusoe Island or Isla Robinson Crusoe in the South Pacific known is the second largest of the Juan Fernández Islands, and lies 670 km west of Chile. A neighbouring island is known as Alejandro Selkirk Island. Robinson Crusoe Island was once known as Más a Tierra (Closer to Land). It was the island that became home to the Scottish castaway Alexander Selkirk from 1704 to 1709, and is said to have inspired Daniel Defoe’s novel Robinson Crusoe (1719). To reflect the literary associations of Más a Tierra – but more especially to attract tourists – the Chilean government renamed the place Robinson Crusoe Island in 1966. I was on Robinson Crusoe Island last year [9 September 2014] when I was on study leave in Cambridge – but not in the South Pacific. 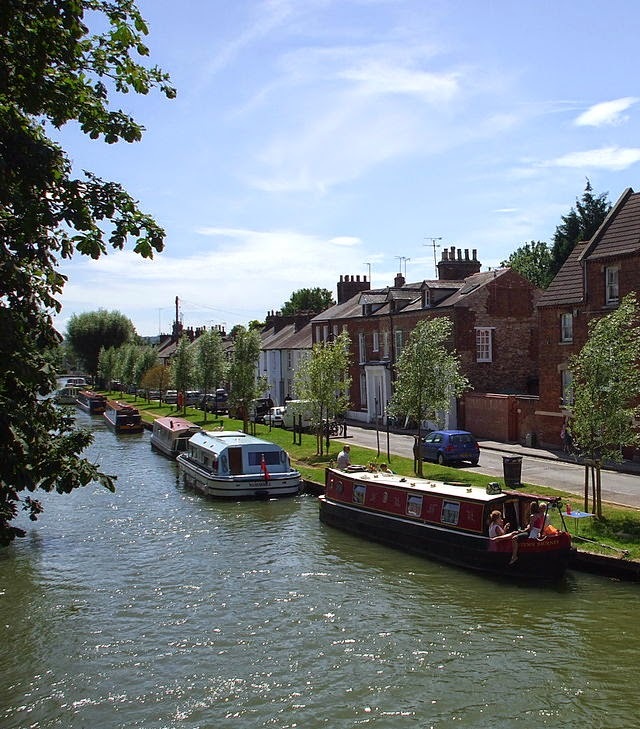 Instead, the Robinson Crusoe Island I visited is a tiny islet in the River Cam, between Coe Fen to the east and Sheep’s Green to the west, on a point on the river south of the weir where Scurdamore’s Punts are moored at Silver Street Bridge and immediately north of the Fen Causeway. Robinson Crusoe Island was once known as Swan’s Nest, but the present name has been in use for more than a century. The land is deceptive in places here, and many apparently dry channels running through the grass are filled with marshy water, often filled with reeds and damp growth. These channels date back to the time when this area had many mills grinding corn for Cambridge. Sheep’s Fen or Sheep’s Green is the common between the two branches of the River Cam, crossed by Fen Causeway. At one time, sheep were grazed on Sheep’s Green. Today, cattle are grazed here instead, and the hazards for walkers include the cowpats and channels running through the grass. Laundress Green is an area south of Silver Street Bridge and opposite Darwin College. This small island on the River Cam is enclosed by the river and the old mill race. It gets its name from the college washerwomen who once used the green for washing and drying. There was once an island at Garret Hostel Green. In 1613, after 66 years of negotiations, Trinity College and the town did a deal, creating Parker’s Piece as common pasture. In return, Trinity gained an island in the River Granta called Garret Hostel Green, north of the modern Garret Hostel Lane, and now occupied by the Wren Library and lawns. Garret Hostel had been incorporated into Trinity College and the Lane was created to allow the people of Cambridge continued access to the river. Thorney Island was once an eyot or small island on the River Thames, where Westminster Abbey and the Palace of Westminster or Houses of Parliament were built. The island was formed by rivulets of the River Tyburn, which entered the Thames near the lowest point where it could be forded from the north bank at low tide. The boundaries were once described as the Chelsea Waterworks, the Grosvenor Canal and the ornamental water in Saint James’s Park. Thorney Island is said to be the place where of King Canute showed that he could not command the tides. 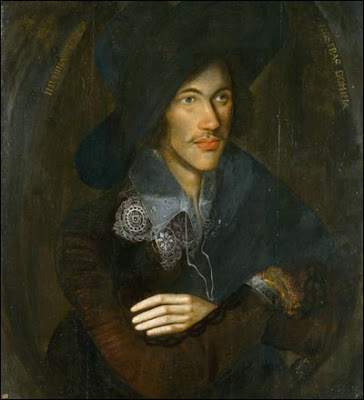 Today, the majority of the inhabitants of Thorney Island are the schoolboys of Westminster School. It is said the Abbey’s College Garden is 1,000 years old and the oldest garden in England. But in the meantime the rivulets have been built over, the Thames has been embanked, and there is now no sign of Thorney Island. The only legacy of this secret, little-know island survives in the name of Thorney Street, at the back of the MI5 building. Osney or Osney Island is a riverside community on the west of Oxford, also known as Osney Town. This island off the Botley Road, just west of the main railway station, is surrounded by the River Thames, Osney Ditch and another backwater connecting the Thames to Osney Ditch. Osney is part of the city council ward of Jericho and Osney. However, until the early 20th century, the name was applied to another island, between Castle Mill Stream and the main stream of the Thames. There Osney Abbey was founded on the south of the island in 1129, Rewley Abbey was built on the north side of the island in 1280, and Osney Mill was later built on the west side of the island. The island is mentioned in ‘The Miller’s Tale’ in Chaucer’s The Canterbury Tales. The abbeys, their lands and the island passed to Christ Church at the Dissolution of the Monasteries in 1538. Osney Town was laid out in 1851 on an island west of Osney leased from Christ Church, and today the name Osney is today usually applied to Osney Town, with 200 or so households in 19th century terraced cottages, and the name Osney is no longer applied to the island that bore the name in history. Île-de-France (“Island of France”), with 12 million inhabitants, is the wealthiest and most populated regions in of France. It was created as the District of the Paris Region in 1961, and was renamed after the historic province of Île-de-France in 1976. Despite the name change, Île-de-France is still popularly known among French people as the Région Parisienne or Franciliens. It is made up of eight administrative departments: Paris, Essonne, Hauts-de-Seine, Seine-Saint-Denis, Seine-et-Marne, Val-de-Marne, Val-d’Oise and Yvelines. Although Île-de-France is not truly an island, I am familiar with three islands in the River Seine in Paris. The Île de la Cité is one of two remaining natural islands in the Seine within the city of Paris – the other is the Île Saint-Louis. This is the centre of Paris and it is here the mediaeval city was refounded. Most visitors to Paris know the island because Notre Dame Cathedral stands at the eastern end of the Île de la Cité Oher sites here include the Mémorial des Martyrs de la Déportation, a memorial to the 200,000 people deported from Vichy France to the Nazi concentration camps during World War II. The Île Saint-Louis is the second of two remaining natural islands in the Seine within the city of Paris. The island is connected to the rest of Paris by four bridges to both banks of the river, and to the Île de la Cité by the Pont Saint-Louis. 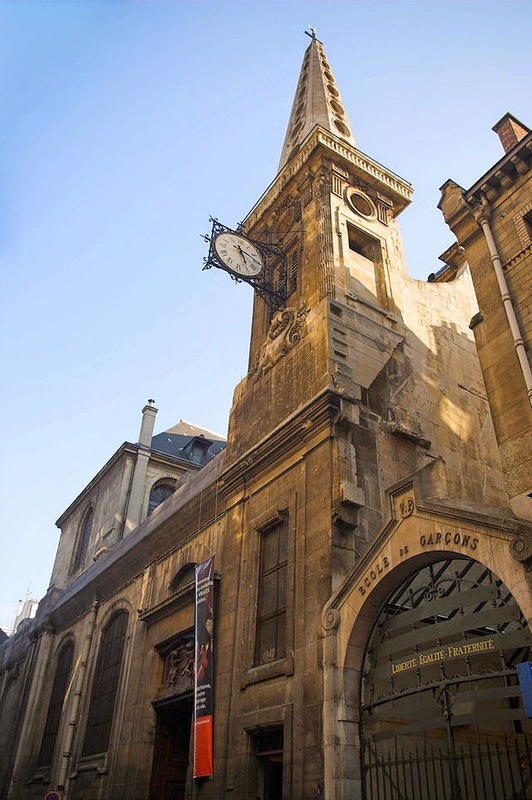 It is named after King Louis IX (1226-1270). This island was formerly used for grazing market cattle and stocking wood. Today, it is a peaceful oasis of calm in the centre of Paris, with its narrow one-way streets but no metro station and only two bus stops. Most of the island is residential, but there are several restaurants, hotels, shops, cafés and ice cream parlours at street level, as well as one large church, Saint-Louis-en-l’Île (Saint Louis on the Island). Île aux Cygnes (“Isle of the Swans”) is a small artificial island in the Seine, located in the 15th and 16th arrondissement. The island was created artificially in 1827 to protect the port of Grenelle. It is 850 metres long and 11 metres wide, with a tree-lined path, l'Allée des Cygnes, running the length of the island. The island is known to tourists for is replica of the Statue of Liberty which was given to the city of Paris by the American community of Paris, commemorating the centennial of the French Revolution. At first the statue faced east, towards the Eiffel Tower, but it was turned west in 1937, supposedly facing New York and the larger original Statue of Liberty. 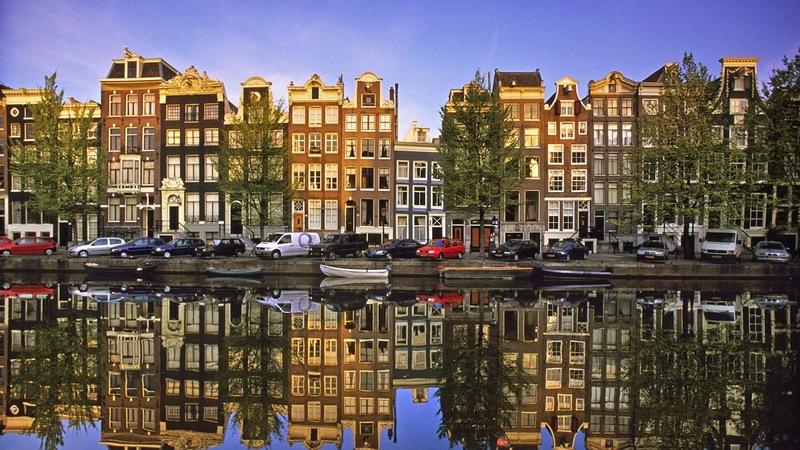 Amsterdam is often nicknamed the “Venice of the North,” due to its division into approximately 90 islands, which are linked by more than 1,200 bridges. Amsterdam began as a fishing village in the late 12th century, and its name derives from Amstelredamme, meaning the dam on the river Amstel. 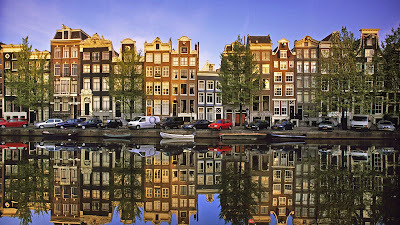 I have often passed through Amsterdam briefly, on my way to toher parts of the world. But I spent a weekend there a few years ago, enjoying the museums, the canals and the gardens. Venice is one of the most breathtakingly beautiful cities in the world, known for its setting, its architecture and its art. The entire city and the lagoon are listed as a World Heritage Site, and stands on a collection of 117 small islands separated by canals and linked by bridges, the best known including the Rialto Bridge and the Bridge of Sighs. No visitor could ever possibly visit each of the 117 islands, although I have been delighted during various visits to Venice to visit Murano, Burano, Torcello, Giudecca, San Lazzaro degli Armeni, San Giorgio Maggiore, Lido and San Michele. During a recent holiday in the Naples area, I spent a day on Capri [8 July 2013] off the coast of Sorrento and on the south side of the Gulf of Naples. Tourism has been part of daily life since the days of the Roman Empire, when the Emperor Tiberius threw his enemies off the cliff-top into the sea. Capri became a popular resort for European artists, writers and other celebrities in the second half of the 19th century. Today, however, few tourists can afford to stay overnight on Capri, particularly in the summer months of July and August, when they jostle with each other to see the Blue Grotto and the Villa San Michele. The islets of I Farglioni are three towering rock stacks off the coast of Capri that jut out from the Mediterranean and soar to a height of almost 110 metres, with a 60 metre long tunnel in the middle arch, the Faraglione di Mezzo. 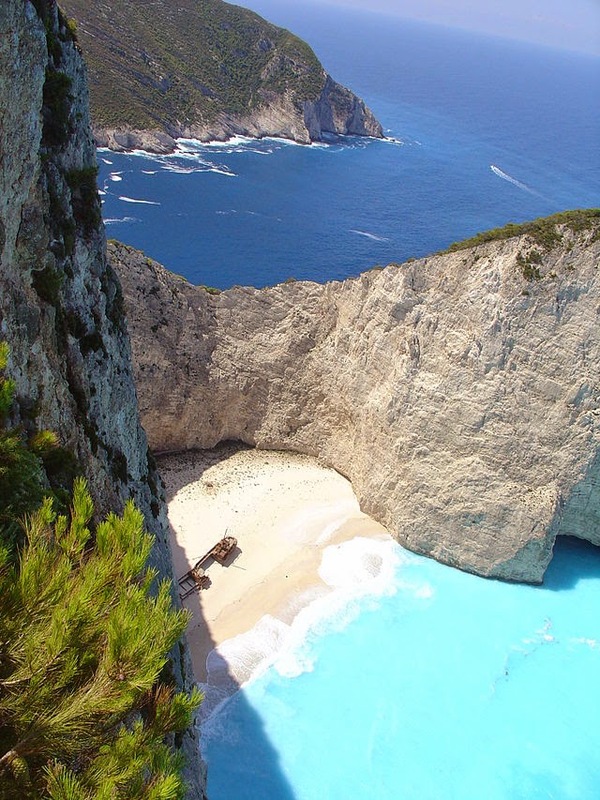 Depending on which estimates you read, Greece has between 1,200 and 6,000 islands. I suppose it all depends on how big and how populated a place is – for example, there are numerous islands, islets and rocks off the coast of Crete. But even when it comes to counting populated islands, the numbers range from 166 to 227. At the rate I am managing to visit them, I suppose I shall never get around to visiting all. But I have many favourites. The ten largest Greek islands by area are Crete, Euboea, Lesbos, Rhodes, Chios, Kephallonia, Corfu, Lemnos, Samos and Naxos, followed by Zakynthos. I have been visiting Crete for almost thirty years, and have almost lost count of how many times I have been there. I have travelled the island from north to south and from east to west, staying mainly in Rethymnon or in the mountain villages above Hersonnisos. Crete (Κρήτη) is the both largest and most populous of Greek island, and the fifth largest island in the Mediterranean. 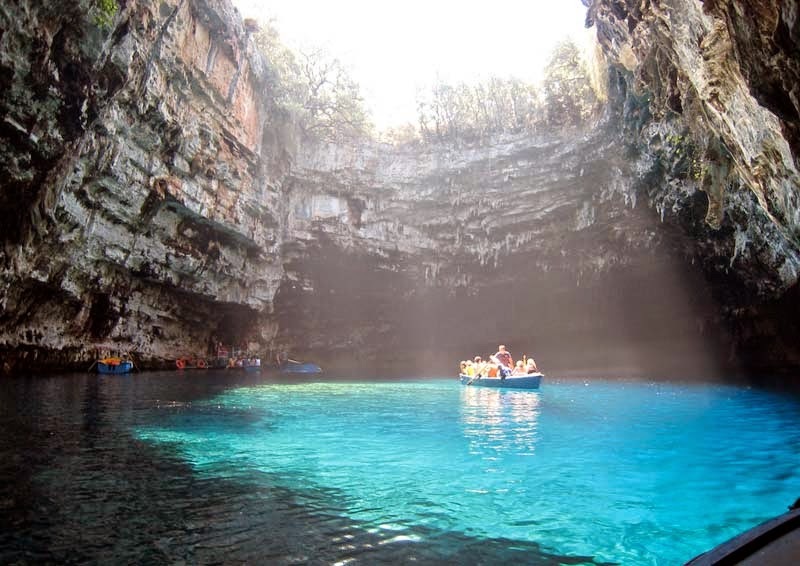 The latest statistics show Crete has a population of 623,065, and the largest city is Iraklion. The island is 260 km from east to west, and 60 km at its widest point but 12 km at its narrowest point. It covers an area of 8,336 sq km, with a coastline of 1,046 km. Crete has at least 50 offshore islands and islands. They include: Gramvousa, the pirate island opposite the Balo lagoon; Elafonisi, which commemorates a shipwreck and an Ottoman massacre; Chrysi, which has the largest natural Lebanon cedar forest in Europe; Paximadia, where it is said Apollo and Artemis were born; Spinalonga, the Venetian fort and leper colony near Elounda and Aghios Nikolaos; and Gavdos, 48 km south of Hora Sfakion and the southernmost point of Europe. I have spent days on both Dia (Δία or Ντία), immediately north of Iraklion and with a registered population of two, and on Spinalonga (Σπιναλόγκα), officially known as Kalydon (Καλυδών). This island in the Gulf of Elounda in north-east Crete, was not an island originally, but part of the island of Crete. During Venetian occupation, the island was carved out of the coast for military purposes and a fort was built on the newly formed island. Until 1957, the island was used as a leper colony, which has been the subject of novels, television series and a short film. I still recall with inner pleasure a late sunny Sunday afternoon on the Cycladic island of Santorini in the late 1980s. I had arrived from Crete the previous day, and had spent some time visiting the villages, churches, monasteries and beaches on the island. Late that afternoon, I was sitting on a terrace in Fira on the steep volcanic cliffs, trying to write a little and sipping a glass of white wine. Behind me, on another terrace above, someone was playing Mozart in the background. Below me, the horseshoe-shaped volcanic cliffs fell down to the blue Aegean sea, and out to the west the sun was about to set. It was one of those moments in time that provided a glimpse of eternity. Late that night, I flew on to Athens. When my holiday in Crete came to end last August , and I was flying from Iraklion to Frankfurt, the plane flew over Santorini, and in my mind’s eye I recalled all the sounds, sights, tastes, smells and thoughts of that sunny afternoon. I have also visited the old Jewish quarter in Rhodes, and written about the horrific experiences of the Jews of Rhodes during World War II. I hope my sons will remember that they have been welcomed to pray in a synagogue by an old woman who survived Auschwitz. I am conscious that tomorrow [27 January 2015] is International Holocaust Remembrance Day. 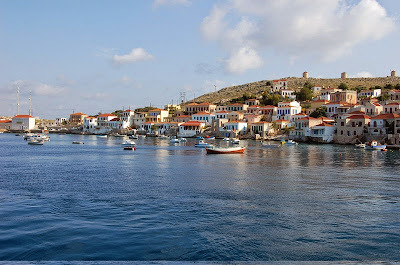 Halki (Χάλκη) is just 6 km off the west coast of Rhodes. In size, it is 28 sq km, and it has a population 478, of making it the smallest inhabited island in the Dodecanese. There are two villages, Chorio (Χωριό) and Emporio (Εμποριό). 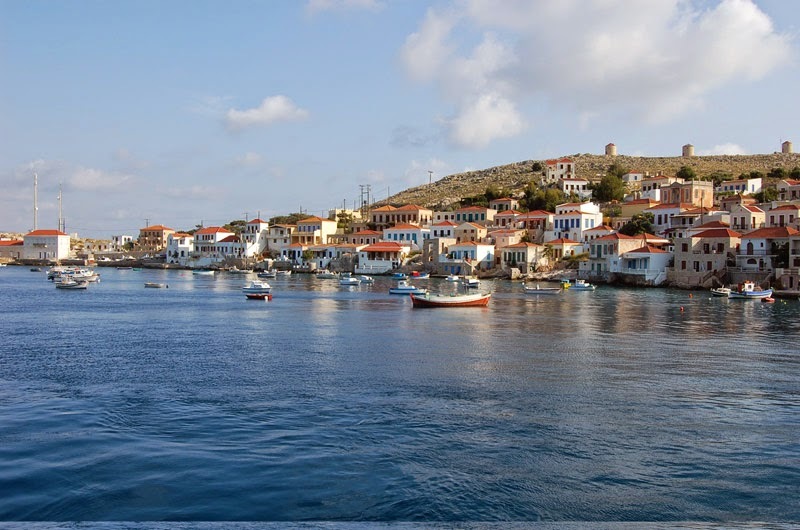 I stayed on Halki in September 2002 when I co–chaired Working Group III, ‘Mediterranean Crossroads: Culture, Religion and Security,’ at the Halki International Seminar, organised by the Hellenic Foundation for European and Foreign Policy (Eliamep). These seminars have been held annually since 1990, bringing together more than 800 scientists, researchers, journalists, politicians, and diplomats from over 50 countries. 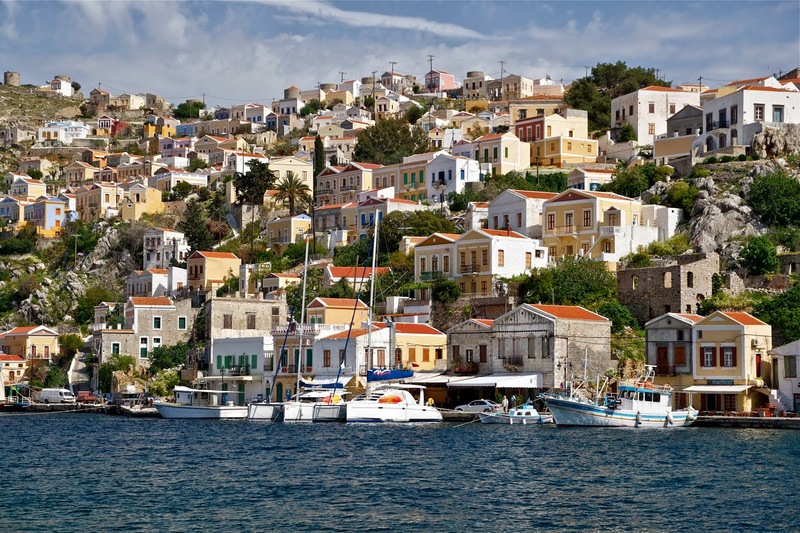 During holidays in Rhodes, I have often visited Symi (Σύμη), about 40 km north-west of Rhodes. The island once had a population of 22,500, but today only has 2,500 residents. Some of my favourite places on Symi include the Monastery of the Archangel Michael Panormitis on the south-west coast; the Kastro overlooking the island’s main town of Ano Symi; the town of Ano Symi, with 13 major churches and dozens of chapels, some dating back to the Byzantine era; and the municipal clock tower built in the 1880s. I first visited Kos (Κως) briefly during the Imia crisis in 1996, and later returned for family holidays. This island in the Dodecanese is just 4 km off Bodrum on the coast of Turkey. It is 40 km long and 8 wide and has a population of 33,388.Kos is one of the parts of Greece with an interesting Turkish-speaking Muslim minority. Hippocrates is said to have been born on Kos, and during that holiday I visited the ruins of the Asklepieion, where Herodicus taught Hippocrates medicine. From Kos, I visited three neighbouring islands, Kalymnos, Pserimos and Patmos. Kalymnos (Κάλυμνος) lies between Kos and Leros. With a population of 16,001, it is the third most populous island of the Dodecanese, after Kos and Rhodes. Kalymnos is known as the “Sponge-divers’ island” so it was a must to buy some large, golden sponges during that visit. At the time, I did not realise that they had been imported because a disease hit the eastern Mediterranean in the mid-1980s, destroying a great number of sponges and damaging the sponge-fishing industry. Still, an annual Sponge Week is celebrated each year a week after Easter. There are a number of inhabited islands off Kalymnos, including Pserimos (80 residents), Telendos (94), Kalolimnos (2), and Pláti (2), as well as several uninhabited islets. Pserimos (Ψέριμος) is a small island of 15 sq km between Kalymnos and Kos, close to the coast of Turkey and with a population of 80. The island’s economy relies almost entirely on tourism, and there are several beaches and a number of tavernas. Pserimos is served by a daily ferry from Pothia, on Kalymnos, but despite the beautiful beaches few people stay for more than a few hours. I travelled alone as a solitary pilgrim, and from the harbour at Skala, I climbed up to the old town of Chora to visit the Monastery of Saint John the Theologian and the Cave of the Apocalypse, where Saint John had the visions that inspired him to write the Book of Revelation. I have visited Samos (Σάμος) about four or five times, taking the 1.6 km crossing on the daily ferry from Kusadasi on the western coast of Anatolia, and visiting both Vathy and Pythagoreio. Samos is north of Patmos and in ancient times was a rich and powerful city state. This is the island of Pythagoras, the philosopher and mathematician who gave us the concept of the cosmos. The island is the birthplace of two national poets, Dionysios Solomos, Greece’s national poet, and Ugo Foscolo, a national poet of Italy. I first visited Kephalonia (Κεφαλονιά or Κεφαλλονιά) when I was staying on Zakynthos, and visited the Melissani Lake, the Drogarati caves, the Koutavos Lagoon in Argostoli and Cape Aghios Georgios. I returned for a holiday in Argostoli the following year. From Kephalonia, I caught a ferry to Ithaka (Ιθάκη) which has an area of 120 sq km and about 3,000 inhabitants. The capital, Vathy or Ithaki, has one of the largest natural harbours in the world. Some years ago I was a visiting lecturer at the Durrell of School of Corfu, lecturing on key Irish people who were involved in the Greek War of Independence. 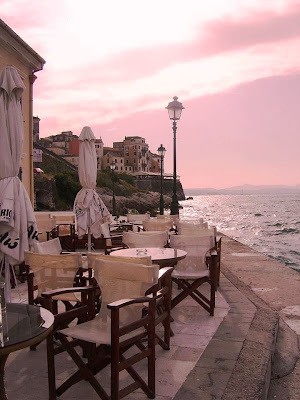 Corfu (Κέρκυρα) is the second largest of the Ionian Islands and sits on the north-west edge of Greece. 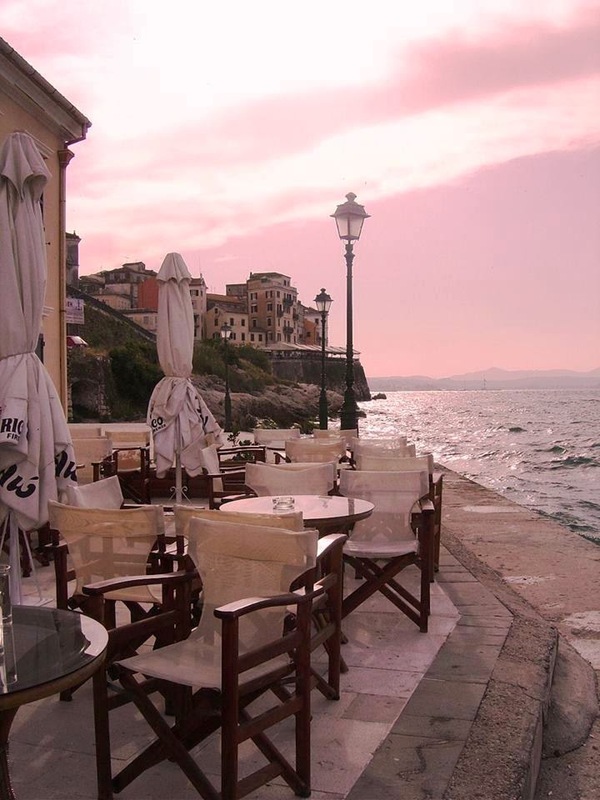 The principal city of the island is Corfu, with a population of over 32,000. I stayed in the Konstantinoupolis Hotel, a traditional hotel in the centre of the old town of Corfu. I tried but failed to catch a boat to Lazaretto Island, once known as Aghios Dimitrios, off the coast of Corfu, but because Corfu lies off the coast of Albania, I was able to visit Sarandë and Butrint, and to meet members of the Greek community in Northern Epiros in Albania. When I had finished that week’s work in Corfu, I visited the small white-washed convent of Vlahérna on the tiny islet of Pontikonisi (Mouse Island) and the Monastery of Vlahérna, 2 km south of Corfu town and beneath the hilltops of Kanoni. This small island is joined to the island of Corfu by a narrow causeway. Having reached 63, I am entering my 64th year. Perhaps I am entitled to indulge myself with another, 64th island. 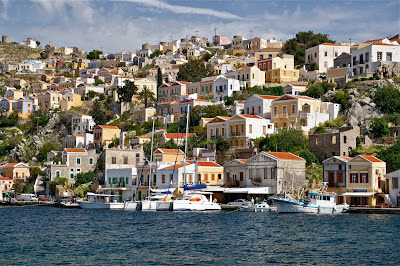 Kastellorizo (Καστελλόριζο) is the most remote island in Greece I have visited. It lies about 2 km off the south coast of Turkey, and I visited the island while I was staying in Fethiye in south-west Turkey. But it is 570 km south-east of Athens and 125 km east of Rhodes. It is another 280 km to Cyprus. So it is closer to Cyprus and Turkey than to any part of Greece, and part from Cyprus this is the most easterly point of the European Union. But there were so many other islands to choose from in Greece, Cyprus, Denmark, Sweden or Turkey, including the islands off Kusadasi or Fethiye, or the islands in the Bosporus near Istanbul … or perhaps further afield including Lantau and Hong Kong, or in Japan, such as Honshu and Hokkaido. I am not island, to paraphrase John Donne. But neither am I short of islands to visit or to be reminded of. Next year should I contemplate 64 favourite beaches, poems, river-side walks, churches and cathedrals, hymns, pieces of music ... ?